There are limited long-term outcome data in eculizumab-treated patients with atypical hemolytic uremic syndrome (aHUS). We report final results from the largest prospective, observational, multicenter study of patients with aHUS treated with eculizumab. Patients with aHUS who participated in any of five parent eculizumab trials and received at least one eculizumab infusion were eligible for enrollment in a long-term follow-up study. Rates of thrombotic microangiopathy (TMA) manifestations off versus on eculizumab were evaluated. Additional endpoints included change from baseline estimated glomerular filtration rate (eGFR), long-term renal outcomes, and serious targeted treatment-emergent adverse events. Among 93 patients (0–80 years of age), 51 (55%) remained on eculizumab and 42 (45%) discontinued; for those who discontinued, 21 (50%) reinitiated therapy. Patients who reinitiated eculizumab had similar baseline clinical characteristics to patients who remained on eculizumab, with higher likelihood of genetic/autoimmune complement abnormalities, more prior TMAs, and longer disease course versus those who did not reinitiate. Mean eGFR improved rapidly and remained stable for up to 6 years on eculizumab. In patients who discontinued, there was a trend toward decreasing renal function over time from discontinuation. Additionally, off-treatment TMA manifestation rates were higher in those aged < 18 years at diagnosis, with identified genetic/autoimmune complement abnormalities, or history of multiple TMAs prior to eculizumab initiation. The safety profile was consistent with previous studies. Three definite and one possible meningococcal infections related to eculizumab were reported and resolved with treatment. Three deaths unrelated to eculizumab were reported. The current study confirms the efficacy and safety of eculizumab in aHUS, particularly with regard to long-term renal function and TMA events. Pediatric age at disease onset and presence of genetic or autoimmune complement abnormalities are risk factors for TMA events off treatment. Overall, patients who discontinue eculizumab may be at risk for additional TMA manifestations and renal function decreases. Discontinuation of eculizumab, with careful monitoring, is an option in select patients with consideration of patient preference, organ function normalization, and risk factors for relapse, including mutational analysis, age of onset, and history of multiple TMA episodes. ClinicalTrials.gov NCT01522170, January 31, 2012. The online version of this article ( https://doi.org/10.1186/s12882-019-1314-1) contains supplementary material, which is available to authorized users. Atypical hemolytic uremic syndrome (aHUS) is a rare disorder caused by overactivation of the alternative pathway of complement and is primarily characterized by thrombotic microangiopathy (TMA) [1, 2]. Classic manifestations include thrombocytopenia, microangiopathic hemolytic anemia, and acute kidney injury, although other organs are often also affected. During the era when plasma infusion or plasma exchange was the mainstay of management, aHUS was associated with a poor prognosis. Historically, 36% of children and 64% of adults developed end-stage renal disease or died within 3 to 5 years of disease onset . Eculizumab (Soliris®, Alexion Pharmaceuticals, Inc., Boston, MA, USA) is a humanized monoclonal complement inhibitor that is the first and only approved treatment for patients with aHUS [4, 5]. Eculizumab binds with high affinity to C5, inhibiting C5 cleavage to C5a and C5b and preventing the generation of the terminal complement complex C5b-9, thus inhibiting complement-mediated TMA. Eculizumab was proven to be effective in patients with aHUS in five clinical studies [6, 7, 8, 9, 10], in which it resolved and prevented complement-mediated TMA, improving renal function and hematologic outcomes. Optimal duration of eculizumab therapy in aHUS has not yet been determined. The potential risk of developing TMA following discontinuation of treatment [4, 5] and the recommendation of lifelong treatment  have been noted in current regulatory guidance. We conducted a large prospective, long-term, observational study of patients with aHUS who were treated with eculizumab. Data from an interim analysis (cutoff date: March 28, 2015; median exposure, 45.9 months) showed a lower rate of TMA manifestations in patients who were receiving eculizumab versus patients who were not on therapy . Here, we report the final results from this study. This was a long-term, prospective, observational, multicenter follow-up study (NCT01522170) of patients with aHUS who were treated with at least one infusion of eculizumab in any of five previously conducted parent studies, several of which included pediatric and/or adolescent patients < 18 years of age [6, 7, 8, 9, 10] (Fig. 1). Study methodology has been published previously , but is summarized in brief herein. Participating patients received meningococcal vaccination in the parent eculizumab trials [6, 8, 9] and were revaccinated according to their respective country guidelines. Use of antibiotic prophylaxis was not required per the study protocol but was permitted at the investigators’ discretion. Assessment of genetic and autoimmune complement abnormalities was performed in all patients upon entry into the parent studies by a centralized laboratory and was not repeated during the current study. Baseline characteristics were recorded before the first infusion of eculizumab in the parent studies. In the parent studies, patients were administered eculizumab as per the dosing schedule described in the prescribing information. Patients were enrolled in the current study at the completion of the parent study. During the current study, changes in dosage and treatment duration were permitted at the investigators’ discretion. Clinical outcomes were compared based on eculizumab treatment status. The first on-treatment period was defined as the date from the first infusion through 3 weeks after the last eculizumab infusion, or until patient discontinuation from the study or data cutoff (whichever occurred first). The first off-treatment period was from 3 weeks after the last infusion of eculizumab until the patient restarted eculizumab, or until patient discontinuation from the study or data cutoff (whichever occurred first). Subsequent on- and off-treatment periods were defined similarly and patient groups were not mutually exclusive. The primary study endpoint was the rate of TMA manifestations in the current study during off and on treatment. The criteria used to define TMA are described in Table 1 . Additional endpoints included change in renal function, long-term renal outcomes, and assessment of serious targeted treatment-emergent adverse events (TEAEs). Post hoc analyses were conducted to evaluate the TMA manifestation rate by comparing off- and on-treatment periods in the current study. Rates were also compared based on patient characteristics, including identified genetic or autoimmune complement abnormalities, age, history of TMA events, and transplant status. Changes in renal function were measured using estimated glomerular filtration rate (eGFR). For patients who remained on eculizumab throughout the study, eGFR was compared between values determined 6 months after the initiation of eculizumab and last follow-up. For patients who discontinued eculizumab, eGFR was compared immediately prior to discontinuation and at last follow-up. For patients who discontinued but later reinitiated eculizumab, eGFR was compared immediately prior to discontinuation and at last follow-up after eculizumab reinitiation. Patients were not included in the analysis if these data were unavailable. Renal outcomes for individual patients were assessed independently by the principal investigator and two additional investigators, and reported as improved, stable, or declined; final findings were adjudicated by the principal investigator. Serious targeted TEAEs were predefined as incidence of serious infection, meningococcal infection, sepsis, leukopenia, infusion reactions, hepatic impairment, and malignancy. At the final data cutoff on March 30, 2017, a total of 93 patients (26 children/adolescents, 67 adults) were enrolled in the study (Fig. 1). Of these, 82 patients had on-treatment periods during the current study. Overall, 51 patients (55%; 22 children/adolescents, 29 adults) remained on eculizumab throughout the current study, while 42 (45%; 17 children/adolescents, 25 adults) had at least one off-treatment period. Twenty-one patients (50%) who discontinued eculizumab later reinitiated treatment. Reasons for reinitiation included TMA or renal impairment (n = 11), preparation for a kidney transplant (n = 5), short discontinuation period due to change in dose or missed doses (n = 2), administrative reasons (n = 2), and multiple serious AEs and a change in dosing (n = 1). Baseline patient characteristics at entry into the parent studies are presented in Table 2. Overall, 55 patients (59%) had an identified genetic or autoimmune complement abnormality. Compared with patients who discontinued eculizumab and did not reinitiate, patients who reinitiated eculizumab trended toward being younger (median 21 vs 30 years of age at first eculizumab dose), male (76% vs 52% female), treated sooner following the most recent TMA manifestation (median 0.4 vs 0.6 months), diagnosed for a longer time period before parent study entry (median 3.0 vs 0.5 months), having more prior TMA manifestations (38% vs 24% with ≥ 2 manifestations), and being more likely to have genetic or autoimmune complement abnormalities (67% vs 48%) (Table 3). Duration of eculizumab therapy and follow-up time by treatment status is presented in Additional file 1: Table S1. The median (range) of follow-up overall (parent and long-term follow-up studies combined) was 65.7 (9.9, 102.2) months (> 5 years). The duration of eculizumab treatment prior to the first discontinuation was 19.6 (0.2, 86.9) months and time to reinitiation was 4.7 (0.7, 69.3) months. 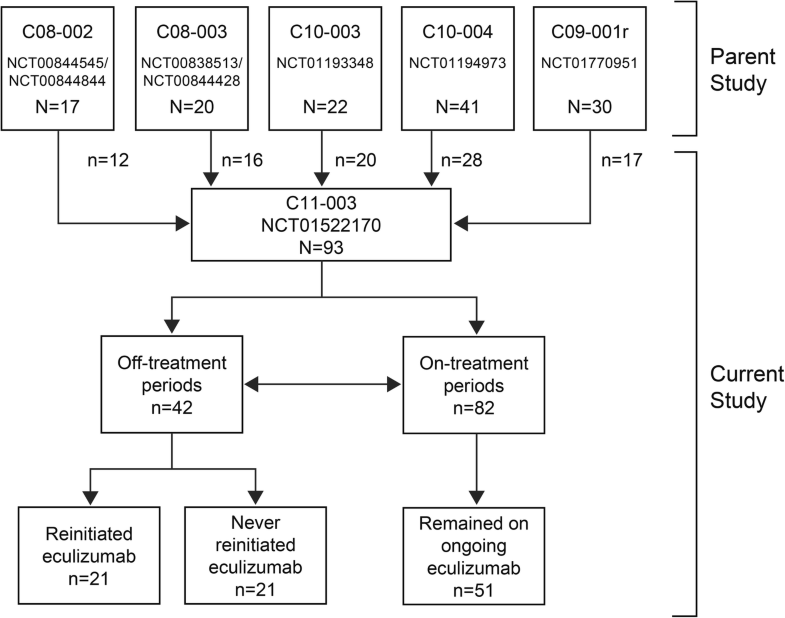 Patients who reinitiated eculizumab after discontinuation had an overall exposure of 56.3 (1.3, 91.3) months. During the study, three TMA manifestations occurred in two patients (2%) during on-treatment periods and 14 TMA manifestations occurred in 10 patients (24%) during off-treatment periods (Table 4). The rate of TMA manifestations was 1.0 per 100 patient-years during on-treatment periods and 13.5 per 100 patient-years during off-treatment periods (93% lower on treatment). All 14 TMA manifestations that occurred during off-treatment periods were reported within the first 30 months following discontinuation. In patients who discontinued eculizumab, there were no TMA manifestations during on-treatment periods, and a rate of 13.5 per 100 patient-years in off-treatment periods. When stratifying by patient populations (Table 4), rates of TMA during off- versus on-treatment periods were particularly high in pediatric onset patients (18.9 per 100 patient-years), patients with identified genetic or autoimmune complement abnormalities (18.0 per 100 patient-years), and patients with a history of multiple TMAs (18.0 per 100 patient-years). No TMA manifestations were reported in patients with transplanted kidneys, regardless of treatment status. During the first on-treatment period, eculizumab led to a rapid improvement in mean eGFR, which then remained above or near ≈60 mL/min/1.73 m2 during follow-up on treatment (Additional file 1: Figure S1A). In patients who remained on eculizumab treatment throughout the study and were not on chronic dialysis, median eGFR was 24.0 mL/min/1.73 m2 at baseline and 59.5 mL/min/1.73 m2 at last follow-up (Table 5). In this group of patients, dialysis was required by 18 of 51 patients (35%) at baseline and by 2 (4%) at last follow-up. Patients who discontinued had a higher mean eGFR at the time of discontinuation; over time during follow-up off eculizumab, eGFR slowly decreased but remained > 60 mL/min/1.73 m2 (Additional file 1: Figure S1B). In this patient subgroup, median eGFR was 12.0 mL/min/1.73 m2 at baseline, 92.3 mL/min/1.73 m2 at time of discontinuation, and 75.6 mL/min/1.73 m2 at last follow-up (median [range] follow-up of 31.2 [0.7, 95.1] months; Table 5). Of these patients, dialysis was required by 17 of 35 patients (48.6%) at baseline and by 5 of 35 (14.3%) at last follow-up. Changes in eGFR over time were analyzed for individual patients by treatment status to assess long-term renal outcomes. When comparing long-term kidney function (Table 6), 37 patients (77%) who remained on eculizumab treatment had improved or stable renal function over time; 11 (23%) had a decline in kidney function. Overall, 14 of 35 patients (40%) who discontinued eculizumab had a decline in renal function, including 2 patients (11%) who discontinued and did not reinitiate eculizumab, and 12 patients (75%) who discontinued eculizumab and reinitiated treatment. We have conducted the largest and longest prospective cohort study of eculizumab in aHUS patients, across all age groups. Data from an earlier, interim analysis (cutoff date: March 28, 2015, median exposure, 45.9 months)  provided preliminary information on rates of TMA manifestations occurring both off and on eculizumab treatment. Here, we present the final data from this study, providing 2 additional years of follow-up, subgroup analysis that may inform risk profiles, and evaluation of the long-term renal consequences. In the previous interim analysis , TMA manifestations were defined as either clinical signs and symptoms of TMA, interventions, or changes in laboratory values. Although there is no standard definition of TMA, which may be associated with varying degrees of clinical deterioration and outcomes, it is unlikely that changes in single laboratory values are considered to be TMA manifestations by treating clinicians outside of this trial. Thus, in this final analysis, we employed the more stringent definition (ie, excluding TMA defined by changes in a single laboratory criterion) used in the previous interim report . Based on this definition, the rates in this study were 13.5-fold higher during off-treatment periods compared with on-treatment periods, consistent with the interim report. Ability to identify patients at particular risk for TMA while off treatment would be beneficial for clinicians when deciding on long-term management, aiming to reduce risk of TMA relapse. Additional patient enrollment and length of follow-up allowed for evaluation of TMA manifestation rates by patient subgroups, although the study was not specifically designed to facilitate these comparisons. TMA manifestation rates were particularly high off treatment in patients with identified complement genetic or autoimmune abnormalities. These findings are consistent with previous long-term retrospective analyses of the natural history of aHUS in the pre-eculizumab era [3, 12] as well as previous prospective and retrospective analyses of eculizumab discontinuation [13, 14, 15, 16]. Our current findings also highlight new patient subgroups that may be at particular risk for TMA relapse when taken off treatment, including patients with pediatric onset, and/or those with a history of multiple TMAs. Due to the historically higher mortality rate in pediatric patients and patients diagnosed before adulthood, it is crucial to protect these patients from additional TMA manifestations . When comparing findings from the current analysis to those from a retrospective study of eculizumab discontinuation in a French cohort , previous history of multiple TMA manifestations has been consistently identified as a factor of potential importance for TMA risk while off treatment. Patients with kidney transplants were excluded from the analysis by Fakhouri et al. , but TMA events after discontinuation of eculizumab among patients with aHUS following kidney transplants have been reported elsewhere . Interestingly, in this study, no TMA manifestations were reported off or on treatment in patients who had transplants. When evaluating profiles of patients with transplants, patients who remained on therapy were more likely to have higher-risk complement abnormalities (ie, CFH, CFB, and C3 mutations) and/or multiple history of graft loss. This could suggest that, in this study, transplant patients who discontinued had a lower risk profile overall. Recent guidance from Kidney Disease: Improving Global Outcomes (KDIGO)  includes the recommendation that transplant patients, and particularly those with history of previous graft loss, should not discontinue eculizumab because of historically high risk of recurrence and graft loss in the pre-eculizumab era . Data from a case series by Levi et al. document risk of TMA post-eculizumab discontinuation in a transplant patient. However, Duineveld et al. suggest that transplantation in aHUS is possible without prophylactic eculizumab, particularly with living donors, use of lower-dose immunosuppressive regimens, and strict blood pressure control to mitigate endothelial injury. Data from the Global aHUS Registry suggests better outcomes in patients with transplants who initiated eculizumab prior to transplant . Further studies are required for this patient subgroup. With respect to consequences of TMA and long-term renal outcomes, this study includes the longest-term follow-up (median, 65.7 months of follow up [ie, > 5 years]) of changes in eGFR ever reported in patients with aHUS. Renal function loss following TMA manifestation was improved with eculizumab, and this improvement was maintained for a median of 74 months (> 6 years) of follow-up. At the time of discontinuation, patients who discontinued eculizumab had higher eGFRs than the on-treatment plateau value in patients who never discontinued. Because discontinuation was at the investigators’ discretion, we can only speculate as to why this was the case. It may reflect decreased concern regarding risk of TMA in patients with fairly normal kidney function, and a choice was made to discontinue treatment. We observed a trend toward a decline in kidney function in the group of patients who discontinued eculizumab. This was observed when evaluating the median eGFR over time and, more importantly, when evaluating individual patients during the period when eculizumab was discontinued. Patients who discontinued eculizumab were almost twice as likely to have a decline in kidney function than patients who never discontinued (40% vs 23%) and were less likely to have an improvement in kidney function (6% vs 35%). Because this decline was irrespective of whether a patient had a reported TMA event, it is possible that some patients had “subclinical” TMA activity after eculizumab discontinuation. 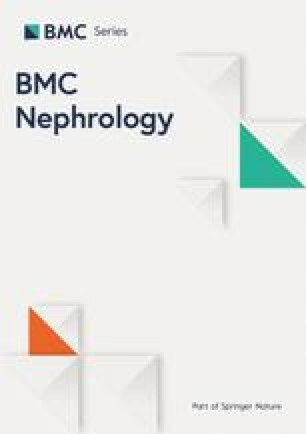 An analysis of individual patient outcomes in the pediatric patients in this study (Unpublished data, Pape et al., European Society for Paediatric Nephrology, 2018) revealed that after eculizumab discontinuation, some patients maintained renal function but some returned to pre-eculizumab eGFR values, particularly following a TMA event. Perhaps not surprisingly, those patients who reinitiated eculizumab were especially likely to have a decline in kidney function when not receiving eculizumab. Half of the patients who discontinued eculizumab later reinitiated during the study, mostly due to TMA/renal impairment, or in preparation for a kidney transplant. One patient had multiple serious adverse events and a change in dosing; treatment was reinitiated to salvage his condition, but the patient eventually died during this study. The two patients categorized as “due to change in dose or missed doses” likely would not have been categorized as having discontinued in clinical practice, but were retained in this category based on the definition in the statistical analysis plan of this study. Shifting these two patients to the group of patients who remained on eculizumab based on sensitivity analysis would not have changed outcomes, because no TMA manifestations were reported in these patients. There were differences between the subgroups of patients who reinitiated eculizumab and those who discontinued eculizumab and never reinitiated therapy. Interestingly, a lower proportion of females reinitiated treatment (52% of the subgroup) than those who never reinitiated treatment (76% of the subgroup). Patients who reinitiated treatment were younger and were more likely to have identified complement genetic or autoimmune abnormalities and a history of multiple TMA manifestations, which is similar to the subgroup of patients who never discontinued. Evidence from a pooled, post hoc analysis of the eculizumab clinical trial program in aHUS  demonstrated that younger age is among the factors associated with better outcomes on eculizumab. In that analysis, earlier initiation of eculizumab led to improved renal recovery . It is yet to be determined how TMA history before initiation of therapy may affect the disease course after discontinuation. The safety profile was consistent with those reported in the parent trials [6, 7, 8, 9]. Three deaths were reported and were determined to be unrelated to eculizumab treatment. Three definite and one possible meningococcal infections related to eculizumab were reported during this study, and resolved with appropriate antibiotic treatment. The number of meningococcal infections may be related to the sample size in the study, the severity of the patient population included in the trial population [6, 7, 8, 9], as well as that the events largely occurred before the more widespread use of antibiotic prophylaxis. A larger post-marketing analysis of safety events and, specifically, meningococcal infections has been performed in all patients treated with eculizumab for paroxysmal nocturnal hemoglobinuria and aHUS worldwide. This report provided 10 years of safety information and included a meningococcal infection rate of 0.25 per 100 patient-years, which tended to decrease in frequency over that time period . Clinicians should continue to consult regulatory guidance [4, 5] regarding patient counseling of the eculizumab benefit/risk profile, early signs of meningococcal disease, and processes for seeking immediate medical care. The Centers for Disease Control and Prevention has noted that antibiotic prophylaxis is generally considered to be safe, and suggests that clinicians could consider its use for the duration of eculizumab treatment . One limitation of this study is that discontinuation of eculizumab was not done randomly but at the discretion of investigators and patients, and other possible management strategies of aHUS were not evaluated. Hence, the results must be interpreted cautiously. However, it seems likely that patients who were perceived to be at higher risk of TMA would be less likely to discontinue therapy. Changes in dosage were permitted at the investigators’ discretion and also were not randomized. Another limitation is that small patient numbers and TMA manifestations prevented robust analysis of patient subgroups. In addition, requirement of serum creatinine level to be both increased by ≥ 25% and above the upper limit of normal to qualify as a TMA manifestation may have resulted in missed TMA among patients with low muscle mass and low baseline creatinine levels. Finally, identification and validation of sensitive biomarkers of early signs of TMA recurrence may assist in managing these patients long-term for optimal outcomes. In summary, this long-term, prospective study confirms the efficacy and safety of eculizumab in the treatment of aHUS, especially as it relates to improvement and maintenance of stable kidney function over 6 years and a very low rate of TMA during that time. Discontinuation of eculizumab was associated with higher risk of TMA and trends toward decreases in renal function over time, despite very high mean eGFR at the time of discontinuation. These findings confirm a similar analysis recently conducted in the patient population enrolled in the Global aHUS Registry . Patient subgroups at the highest potential risk for TMA post-discontinuation were identified and included pediatric disease onset, identified genetic or autoimmune complement abnormalities, and a history of multiple TMAs. Consideration of such risk factors is important during treatment decision-making for patients with aHUS, and close monitoring for signs of TMA and rapid reinitiation of treatment at early signs of TMA is needed for patients who discontinue eculizumab therapy. Under these conditions, discontinuation of eculizumab with careful monitoring may be an option for select patients with aHUS. The sponsor and investigators thank the patients and their families for their participation in and support for this clinical study. The authors would like to acknowledge Peloton Advantage, LLC, an OPEN Health company, which provided medical writing and editorial support by Kristen W. Quinn, PhD, with funding from Alexion Pharmaceuticals, Inc.
Alexion Pharmaceuticals, Inc., was responsible for the collection, management, and analysis of information contained in the C11–003 Long-term Follow-up study. Alexion Pharmaceuticals, Inc., contributed to data interpretation, preparation, review, and approval of the manuscript for submission. All authors had full access to all the data in the study and had final responsibility for the decision to submit for publication. Medical writing and editorial support were provided by Peloton Advantage, LLC, an OPEN Health company (Parsippany, NJ), and funded by Alexion Pharmaceuticals, Inc. Qualified academic investigators may request participant-level, de-identified clinical data and supporting documents (statistical analysis plan and protocol) pertaining to this study. Further details regarding data availability, instructions for requesting information, and our data disclosure policy will be available on the Alexion.com website (https://alexion.com/research-development). JM, YD, FF, CL, EEM, FP, ER, NSS, LEW, and LAG created and designed the study and developed the protocol, recruited patients and collected data, analyzed and interpreted the data, and wrote the manuscript. ÅL and JW created and designed the study and developed the protocol, analyzed and interpreted the data, and wrote the manuscript. All authors read and approved the final manuscript. Australia: Alice Springs Hospital, Central Australian HERC, Alice Springs; Royal Adelaide Hospital, SAH HREC / CALHN (CEC), Royal Adelaide HREC (LEC), Adelaide; Austria: Medizinische Universitaet Innsbruck, Ethikkommission der Medizinischen Unitversität Innsbruck, Innsbruck; Medical University Graz Division of Pediatric Nephrology, Ethikkommission der Medizinischen Unitversität Innsbruck, Graz; Belgium: CHU de Liège, Comité d’Ethique Hospitalo-Facuitarire Universitaire de Liège (707) (CEC), Liege; UZ Gent Dienst Nefrologie, Comité d’Ethique Hospitalo-Facuitarire Universitaire de Liège (707) (CEC) UZ Gent Ethisch Comité (LEC), Gent; Canada: Centre Hospitalier Universitaire (CHU) Sainte-Justine, Comité d’éthique de la Recherche CHU Sainte-Justine (LEC), Montreal; The Hospital for Sick Children, The Hospital for Sick Children REB, Toronto; University Health Network, University Health Network REB, Toronto; France: Hôpital Pasteur – CHU de Nice Pole Urologie – Néphrologie, CNOM, CNIL, CCTIRS, Nice; CHU de Bordeaux Pellegrin, CNOM, CNIL, CCTIRS, Bordeaux; Hôpital Robert Debré, Service de Néphrologie Pédiatrique, CNOM, CNIL, CCTIRS, Paris; Le Kremlin Bicetre Hospital, Nephrology Unit, CNOM, CNIL, CCTIRS, Le Kremlin Bicetre; Hôpital Edouard Herriot, CNOM, CNIL, CCTIRS, Lyon; CHU de Nantes-Hôpital, Hotel Dieu - Nephro-Greffe (Nephrology), CNOM, CNIL, CCTIRS, Nantes; CHU de Caen Service de Néphrologie Hôpital Clémenceau, CNOM, CNIL, CCTIRS, Caen; Hôpital Bretonneau, IRC Transplantation Rénale, CNOM, CNIL, CCTIRS, Tours; Hôpital de Bois Guillaume-CHU de Rouen, CNOM, CNIL, CCTIRS, Rouen Cedex; CHU St. Etienne–Hôpital Nord, CNOM, CNIL, CCTIRS, Saint Priest En Jarez; Nouvel Hôpital Civil, CNOM, CNIL, CCTIRS, Strasbourg; CHRU de Lille-Hôpital A. Calmette (Nephrologie), CNOM, CNIL, CCTIRS, Lille; Hôpital Tenon, CNOM, CNIL, CCTIRS, Paris; Centre Hospitalier Inter-Communal de Cornouaille, CNOM, CNIL, CCTIRS, Quimper; Hôpital de la Timone Enfants, Unité de Néphrologie, Service de Pédiatrie Multidisciplinaire, CNOM, CNIL, CCTIRS, Marseille; CHU-CH Charles Nicolle Pavillon de Pédiatrie, CNOM, CNIL, CCTIRS, Rouen; Service de Néphrologie/Hémodialyse, CHR Orléans, CNOM, CNIL, CCTIRS, Orleans; Germany: Medizinische Klinik II - Nephrologie und Klinische Immunologie, Ethik-Kommission an der Medizinischen Fakultät (LEC), Aachen; Hannover University Clinic Adult Nephrology, Medizinische Hochschule Hannover Ethikkomission Vorsitzender (LEC), Hannover; Hannover University Clinic Pediatric Nephrology Medizinische Hochschule Hannover Ethikkomission Vorsitzender (LEC). Hannover; Universitaet Heidelberg, Ethik-Kommission der Medizinischen Fakultät Heidelberg (LEC), Heidelberg; Italy: Fondazione IRCCS Ca Granda, Ospedale Maggiore Policlinico, The IRCCS (Italian Research Hospital) Ca' Granda Foundation, Ospedale Maggiore General Hospital (LEC), Milano; Azienda Ospedaliero-Universitaria Careggi, Comitato Etico dell’Azienda Ospedaliero-Universitaria Careggi (LEC), Firenze; A.O. Papa Giovanni XXIII, Comitato di Bioetica Azienda Ospedali Riuniti di Bergamo (CEC), Bergamo; Istituto Giannina Gaslini, Istituto Giannina Gaslini Ethics Committee for Scientific Biomedical Research (LEC), Genova; Ospedale dei Bambini G. di Cristina, Arnas Civico di Cristina Benfratelli Comitato di Bioetica (LEC), Palermo; Netherlands: Academic Center Amsterdam (AMC), Dept. Nephrology / Dept. Pediatric Nephrology Stichting CGR (CEC), Amsterdam; University Medical Center Nijmegen (UMCN), St. Radboud Dept. Nephrology / Dept. Pediatrics, Stichting CGR (CEC), Nijmegen; Radboud University Medical Center, Stichting CGR (CEC), Nijmegen; Sweden: Karolinska Institutet, Karolinska University Hospital – Huddinge, Regionala Etikprövningsnämnden i Stockholm, Stockholm; Switzerland: INSELSPITAL Universitaetsklinik fuer Kinderheilkunde, Kindernephrologie, Kantonale Ethikkommission Bern (KEK) (LEC), Bern; United Kingdom: Exeter Kidney Unit, Royal Devon and Exeter Hospital (Wonford), NRES Committee South West - Cornwall & Plymouth (CEC), Royal Devon & Exeter NHS Foundation Trust (R&D), Exeter; Great Ormond Street Hospital NRES Committee South West - Cornwall & Plymouth (CEC), UCL Institute of Child Health / Great Ormond Street Hospital for Children NHS Foundation Trust (R&D) London; Newcastle Upon Tyne Hospitals NHS Foundation Trust, NRES Committee South West - Cornwall & Plymouth (CEC), Newcastle upon Tyne Hospital NHS Foundation Trust (R&D), Newcastle upon Tyne; Clinical Apheresis Unit, Level 1, Beatson WoSCC Gartnavel General Hospital, NRES Committee South West - Cornwall & Plymouth (CEC), Greater Glasgow & Clyde Health Board (R&D), Glasgow; City Hospital, Nottingham University Hospitals NHS Trust, NRES Committee South West - Cornwall & Plymouth (CEC), Nottingham University Hospitals NHS Trust (R&D), Nottingham; United States: Driscoll Children’s Kidney Center, Driscoll Children’s Hospital IRB, Corpus Christi, TX; Fort Wayne Medical Oncology and Hematology, WIRB (Western IRB - central IRB), Fort Wayne, IN; Arthur James Cancer Hospital, WIRB (Western IRB - central IRB), Columbus, OH; Weill Cornell Medical College, Weill Cornell Medical College IRB, New York, NY; Fox Valley Hematology, Affinity IRB, Oshkosh, WI; Emory Healthcare-Children’s Center, Emory IRB, Atlanta, GA; Cincinnati Children’s Hospital, CCHMC IRB, Cincinnati, OH; Providence Sacred Heart Medical Center & Children’s Hospital, IRB Spokane, Spokane, WA; Children’s Memorial Hospital, Ann & Robert H. Lurie Children’s Hospital of Chicago IRB, Chicago, IL; Westchester Oncology / Hematology Group (New York Medical College Committee for Protection of Human Subjects), Hawthorne, NY; Methodist Hospital (TMHRI IRB), Houston, TX; Children’s Hospital Boston, Boston Children’s Hospital IRB, Boston, MA; University of Utah School of Medicine Pediatric Pharmacology Program, University of Utah IRB, Salt Lake City, UT; Dunwoody Pediatrics & Children’s Healthcare of Atlanta, WIRB (Western IRB - central IRB), Dunwoody and Atlanta, GA; Seattle Children’s Hospital, Seattle Children’s Hospital IRB, Seattle, WA; Children’s Hospital at Montefiore, Albert Einstein College of Medicine IRB, Bronx, NY; Henry Ford Health System, Henry Ford Health System IRB, Detroit, MI; Vanderbilt University Medical Center, Vanderbilt University IRB, Nashville, TN; Duke University Medical Center, Duke University Health System IRB, Durham, NC. Written informed consent was obtained from all participants. JM has received lecture and/or advisory fees from Alexion Pharmaceuticals, Inc., AstraZeneca, Berlin-Chemie, Daiichi Sankyo, Boehringer Ingelheim, and Novartis. YD has received fees from Alexion Pharmaceuticals, Inc., for participation in a symposium and from Sanofi-Ablynx for participation in advisory boards. FF has received fees for participation in advisory boards, experts’ meetings, and/or teaching courses from Alexion Pharmaceuticals, Inc. CL has received grant/research support and/or consultancy fees from Achillion Pharmaceuticals, Inc., Alexion Pharmaceuticals, Inc., and CSL Behring; has received honoraria from Alexion Pharmaceuticals, Inc. and CSL Behring; has submitted patents for CSL Behring and Finnegan, Henderson, Farabow, Garrett & Dunner; is a member of the Editorial Boards for Kidney International, Nephrology Dialysis Transplantation, and Pediatric Nephrology; is a Steering Committee Member of the Alport Syndrome Treatments and Outcomes Registry (ASTOR) and Member of the Safety Board of the European Treatment Trial for Alport Syndrome (EARLY PRO-TECT); is the aHUS International Registry Scientific Advisory Board Chair and HUS International Chair for Alexion Pharmaceuticals, Inc.; and has participated in the Eculizumab in Adolescent Patients With Plasma Therapy-Resistant aHUS (C08–002; NCT00844844), Eculizumab in Adolescent Patients With Plasma Therapy-Sensitive aHUS (C08–003; NCT00844428), and Eculizumab in Pediatric Patients With Atypical Hemolytic-Uremic Syndrome (C10–003; NCT01193348) clinical studies for Alexion Pharmaceuticals, Inc. ÅL is an employee and stockholder of Alexion Pharma GmbH, Zurich, Switzerland. EEM has participated in the C10–004 adult interventional study (NCT01194973) and in the C11–003 observational, follow-up study (NCT01522170) of atypical hemolytic uremic syndrome patients for Alexion Pharmaceuticals, Inc. FP has received honoraria from Alexion Pharmaceuticals, Inc. ER has received fees for participation in advisory boards, experts’ meetings, and/or teaching courses from Alexion Pharmaceuticals, Inc. NSS has received research funding from GlaxoSmithKline plc. JW is an employee and stockholder of Alexion Pharmaceuticals, Inc. LEW has received fees for participation in advisory boards from Alexion Pharmaceuticals, Inc. LAG has received research funding for Emory University from Alexion Pharmaceuticals, Inc., for his participation in the Eculizumab in Pediatric Patients and aHUS International Registry clinical studies; has received grant/research support and/or consultancy fees from AbbVie Inc., Alexion Pharmaceuticals, Inc., Bristol-Myers Squibb, Advicenne Pharmaceuticals, Mallinckrodt Pharmaceuticals, Otsuka America Pharmaceutical, Inc., and Vifor Pharma; has served as a member of a scientific advisory board for Alexion Pharmaceuticals, Inc., and as a member of data safety monitoring boards for Retrophin, Inc. and Relypsa Pharmaceuticals. Additional file 1: Table S1. Follow-up by treatment status. Table S2. Serious targeted TEAEs during current study. Figure S1A and B. Effects on renal function based on eGFR.